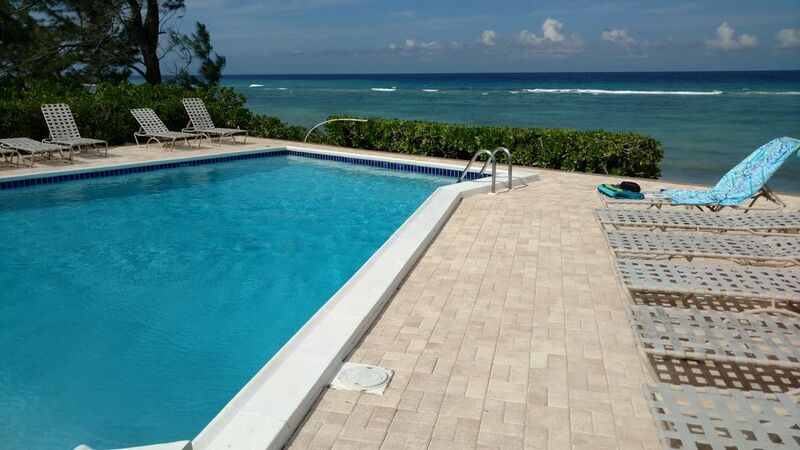 Luxury beachfront 2 bedroom, 2 bath, top floor condominium with central air on beautiful Grand Cayman Island. Island Time is brand new in the fall of 2006 and features luxury appointments including upgraded tile floors, granite counter tops, hardwood cabinets, and top of the line fixtures. All furniture is brand new and reflects the atmosphere of this beautiful Caribbean Island. Every amenity is included for relaxing, dining, and enjoying the pool and warm Caribbean waters at your footstep. And if you need a little contact with the outside world, free wireless Internet is available in the condo. Island Time is the largest condo in a small complex of only ten units. You will find many opportunities to have the pool area all to yourself. The atmosphere is laid back, perfect for relaxation. Water sports, dive shops, beach volleyball, shopping, groceries, restaurants and a marina are just 2 miles away. Island Time is delightfully furnished in island style. There are ceiling fans and vaulted ceilings throughout. The Master Bedroom Suite has a King bed and adjoining bath with oversized tub/shower. The second bedroom has a Queen bed, and a bath with shower. The bedrooms and living area have sliding doors opening to the large screened lanai. The living area is comfortably furnished with sofa, loveseat and entertainment unit. There is a Flat Panel HDTV with premium channel cable and DVD player. The fully equipped kitchen includes a stove, microwave, full-size refrigerator with icemaker, blender, toaster, crock-pot, and all china/cutlery/glassware/linens. There are both indoor and outdoor dinning areas. The unit also has a washer/dryer, iron, ironing board, outdoor grill, and beach towels. Plenty of bath and beach towels provided. King in Master, Queen in Guest, Sleeper sofa in living room. We are here for the 6th time! Just a great week of R&R. No worries, stress is what you want to have for dinner and where! Well supplied with linens, dishes etc. The place was well taken care of set on a very beautiful piece of land. Very pleased! Would highly recommend. U have a pool overlooking the ocean. Everything in a home/kitchen/bathroom/bedroom/washer/ dryer u might need (except food and wash machine supplies). We enjoyed our time at this condo! Beautiful condo in a fabulously peaceful location! Lovely view, very updated and well furnished, and a communicative, helpful owner! Gorgeous deep pool along with an outdoor shower to wash away soft white sand after a lovely stroll on the beach. We did a little snorkeling right there, but the turtle grass bothered me, so we ended up spending time at Starfish Point or driving elsewhere. My husband had no problems with snorting in the turtle grass, and there were also clear channels available. If you’re there to dive or don’t mind the turtle grass, it’s perfect for you. We alternated cooking in and going out, and there were plenty of dishes, pots, pans, etc. The crockpot and toaster both worked well, as does the lovely new electric tea kettle. There was also more closet apace and drawer space than most of the condos we’ve rented. We frequently travel with my sister and her husband, and condos that work well for four adults can be difficult to find. And a comfy bed! I brought my own pillow because I’m a flat pillow girl, but the other adults said their pillows were fine. Both bathrooms also had plenty of drawer space. The furniture was solid and comfortable; no feeling of cheap space for wild spring-breakers. Great if you have a car, which we did, to access restaurants, stores, and swimming beaches. If you’ve never been to Grand Cayman, it is a lovely island; we’ve now spent three weeks there over the years, and hope to spend many more. Do be aware that different parts of the island have different shorelines and different vibes. This shoreline has a sandy beach that goes into reef and turtle grass; you’ll need swim booties with a sole to get into the water. However, we were able to look both directions from the beach and frequently see no other people, so the fabulous privacy factor outshines any mild inconvenience. Finally-the screened lanai overlooking the ocean has plenty of hooks for drying swimsuits, swim fines, booties, and masks. Also games are in a console inside-we almost went out to buy some dominoes, then we found some there. Fun! There aren't enough characters in any of these posts to express the AMAZING vacation we had at Island Time! This condo is beyond belief clean! There wasn't a dust bunny, cobweb, finger print, smudge or stain in site! I've had some pretty nasty experiences with rental condos so my family was really surprised when I took this chance but BOY! am I glad I did! Not only is the condo immaculate, the beds, couches, lanai and dining room table are all so comfortable. It was as comfortable as home with way better weather! I think the building was pretty much full when we were there but it is still super quiet. The pool and grounds are as well kept as the condo inside. You couldn't possibly need for a small appliance, serving spoon, dish, dish cloth, bath towel, beach towel, sheet or blanket that isn't already provided! Not only that, Steve provided perfect directions to the condo and many other great hints as to where to buy groceries and such. My husband is getting close to retirement and he literally cried the last day we were there because he didn't want to leave! We read, swam, went to the Crystal Caves (amazing), went on a jet ski snorkel tour (also amazing), walked 7 mile beach and visited Rum Point a couple of times but we were always glad for our time back at Island Time. Thanks so much Steve, we'll be back! We loved staying at Island Time. The condo was spacious, a great layout, and we loved the view from the screened in porch. Grand Cayman's North Shore is home to one of the best diving locations in the Caribbean; the famous North Wall. Stingray City is a short boat ride away. The spectacular East End is also easily accessible. Several excellent dive shops are nearby; Red Sail Sports, Ocean Frontiers and the Tortuga Divers are favorites. There are excellent restaurants nearby, including Kurts Korner (Seafood/local), The Lighthouse (Italian/Seafood), Kaibo (Cajun/Seafood), Over the Edge (a local favorite), and the Restaurant at Rum Point (Caribbean). Or take the ferry to Camana Bay to sample an incredible variety of restaurants. Water sports, dive shops, beach volleyball, shopping, groceries, restaurants and a marina are just 2 miles away. Please email for specials or if you have less than 4 persons in your party.